Adding soil over grass can be another effective form of repairing a lawn. It is possible to dump new soil over top of what you have, and prepare it for sod or seed. 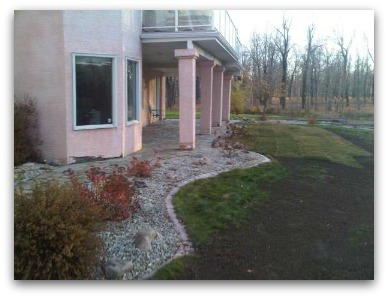 This option will save you money on excavation costs of removing the old soil and grass. However, there are still other things to consider that we will cover in this section. If you are not putting down a thick enough layer of soil to kill everything underneath, you may have to make some other choices. Kill off the existing weeds and lawn with a herbicide, or rent a sod stripper. 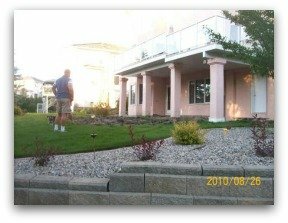 In our example, weeds or poor soil was not the issue, but we had build up the lawn to the new height of a patio installation. We were also repairing some lawn from the equipment damage of removing the old concrete patio. Before shot of a lawn that will need to be blended with new sod, soil, and the old lawn. 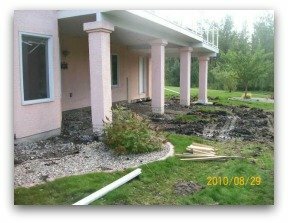 This example of repair was due to removal of an old patio for installation of a new one. It involves re-grading and blending the new sod with the existing lawn. Renting a sod stripper was not needed in our situation, as we had a good lawn underneath the 6 inches of quality soil we put down. Our next section (Option #3), will talk about sodding or seeding directly on the ground or grass. When you consider how much soil you sometimes have to add, the height increase could create a new series of problems. The new problems are created when the work you are doing is not working with the existing features in your yard. 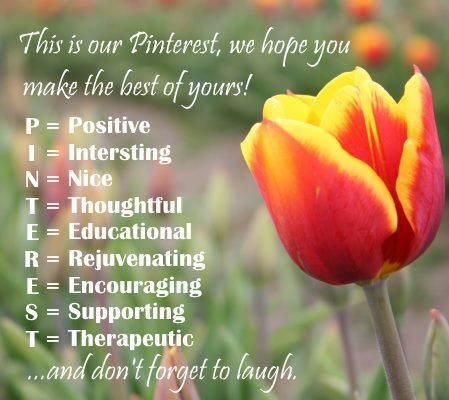 You must also consider the following things below. Proper grading must always be considered with any lawn repair. Get a good overall view of drainage from the lowest viewing spot in the yard. Building up new soil can affect drainage in negative ways. 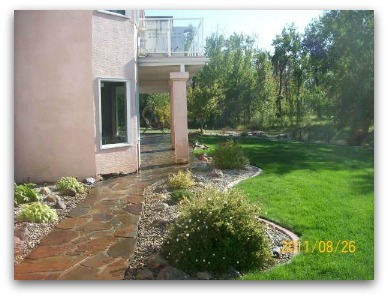 You don't want to have water draining off your new lawn onto your patio area. For those with in-ground irrigation like in our example, we also had to raise sprinkler heads to accommodate the new lawn level. Once you add more than 3 or 4 inches of soil, the amount of weeds and grass that will grow through starts to drop off dramatically. This picture shows the new sod, old lawn, and the soil over top of the old lawn. Blending lawn requires patience. Sod was used in places where 2 inches or more of soil needed to be added. In areas where we put down less than 2 inches, the old grass will grow through and blend with the sod (under 2 to 3 inches). Seed can also be used to help with the blend. In our above lawn repair, we blended the old lawn and the new lawn by sodding only the sections where we had to add the most amount of soil. Up against the patio we added around a foot, so it was necessary to sod. As we moved away from the patio where the old the old lawn was buried by only a few inches of soil, we allowed the old grass to grow through for a nice smooth blend. Seed can also be used when blending lawns, but make sure you use the same grass type. This picture was taken one year after blending soil, new sod, and an old lawn. Patience is a virtue. Our rebuilt and blended lawn as it looked the following season. Be patient, as good results for blending grass may sometimes take a year or two to achieve. Although 4 to 6 inches will kill much of the grass and weeds under it, don't count on it killing it all. It depends on the variety of grass or weeds that you have in your yard. There are other variables as well, and no two people ever seem to have the exact same result. If you put a 6 inch layer of soil down with a layer of sod on top, there will be VERY little chance of anything growing through. A thick mat like this, will kill off almost everything under it. (Almost being the key word). Adding soil over grass gave us great success with our lawn repair, but it may not work for your situation. Make sure you have checked out our other repair options as well. How do you handle lawn weeds? We as humans can be lazy, and we often look for the easy way to do things without considering the consequences. Many people choose chemicals to kill existing grass and weeds. Some are more harmful than others, and more and more cities are banning these harsh products. Be aware of what you are using on your lawn and the effects it will have on the soil. Many products will have warnings telling you how long to wait before seeding or sodding. As we already stated previously in this module, pre-emergents will not only prevent weed seeds from germinating, but grass seeds as well. You may have to use an activated charcoal to neutralize the effects of the pre-emergent. This is for people that really need to get the seed down, but already applied a pre-emergent. You also need to know that your soil contains billions of microscopic organisms call microbes. These microbes are crucial in breaking down, and providing nutrients to the root system. Certain products can kill these microbes leaving you with a sterile (dead), soil. Make sure you know what you are using and the consequences of the product. Rather than controlling weeds with store bought products, get to know your lawn. Spend a few hours once or twice a month if needed, and hand pick the weeds if your yard is small. It is good exercise, and involves NO chemicals. This has advantages, as you will catch diseases, weeds, or insect problems, before they become unmanageable. Adding soil over grass is also not the cheapest option in lawn repair. Once again, the soil must be adequately raked and graded for proper drainage. If you need to know how to grow grass from seed, or how to sod, we recommend a visit to our full modules on seeding and sodding for more tips. Links to shortened versions of these two modules are at the bottom of this page. If you can't raise the level of your lawn because of existing features, or your budget doesn't permit you to purchase a few loads of topsoil, then you may have to consider Sodding Over Grass.